The Soleus DP17003 Dehumidifier is an Energy Star compliant dehumidifier suitable for medium sized areas of up to 800 sq ft (manufacturer's recommendation). It is most effective in a single enclosed area such a single room or a basement. This dehumidifier is portable. It weighs 44 pounds so like most dehumidifiers in its class it is not light-weight. It is, however, equipped with caster wheels making movement easy over smooth floors and a top-mounted carry handle for the occasions when it needs to be moved up stairs or over obstructions. The Soleus DP17003 Dehumidifier has an adjustable humidistat to control relative humidity (RH). With this feature it is possible to regulate the RH to your pre-set level and leave the dehumidifier to cycle on and off as required to keep RH at your preferred level. A typically chosen level is around 50% RH. This is ideal for the comfort of most people and also below the level needed to prevent mold growth and condensation problems. If a dehumidifier set at this level runs continuously and never cycles off it is too small for the area in which it is working. It is more economical to operate a larger capacity machine which is not operating for so many hours than to run a smaller dehumidifier 24/7. The energy efficiency of dehumidifiers, expressed in litres of water extracted per kilowatt-hour increases with the capacity of the dehumidifier. The humidistat is essential for maximum economy and also prevents excessive drying of the air. The Soleus DP17003 dehumidifier is also equipped with an auto-defrost function. Most of you will be aware that ice can form on the coils that form part of the internal workings of a dehumidifier. This is because they are cooled to a low temperature to condense water vapour from the air. These so called "refrigeration coils" are as cold as the ones in your refrigerator. In temperatures below 65°F icing of the coils can occur and will stop the dehumidifier from working until the ice melts. Auto-defrost speeds up the melting process radically and minimises the "down-time". This enables the dehumidifier to continue to function effectively in temperatures as low as 40°F. It is this feature which makes the DP17003 suitable for use in cool conditions such as you might have in your basement. 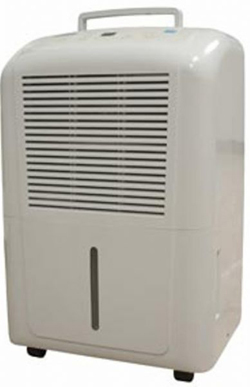 A further feature of the Soleus DP17003 dehumidifier is a facility for continuous drainage. Even with a water collection container capacity of 17 pints the container will have to be emptied at least once, maybe more times, daily. This may be an unwelcome chore or very inconvenient and the solution is to attach a plastic pipe to the dehumidifier and discharge it into a nearby drain or other outlet. The drainage depends on gravity so ideally the dehumidifier should be raised a foot or two to allow this to work to full effectiveness as no condensate pump is fitted within the dehumidifier. Additional features of the Soleus DP17003 dehumidifier include three fan speeds, a shut-off timer which can be set for 2 or 4 hours and auto-restart to ensure the machine starts operating again following a power cut. Consumer reaction is positive. Universal agreement that the dehumidifier works well and dissatisfaction restricted to minor issues and still accompanied by 4 and 5 star ratings.